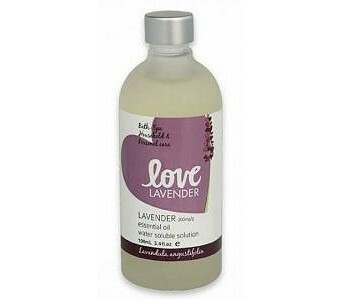 Love Lavender Water Soluble Solution is a convenient way to benefit from the relaxing and therapeutic advantages of Lavender oil. Readily dissolved in water, it can be added to a relaxing bath or spa and is gentle on the skin. Kid friendly, it makes a relaxing and soothing addition to your child's nightly bath ritual. With it's pleasant smell, Love Lavender Essential Oil water soluble solution doubles as an effective, eco-friendly household cleaning product.